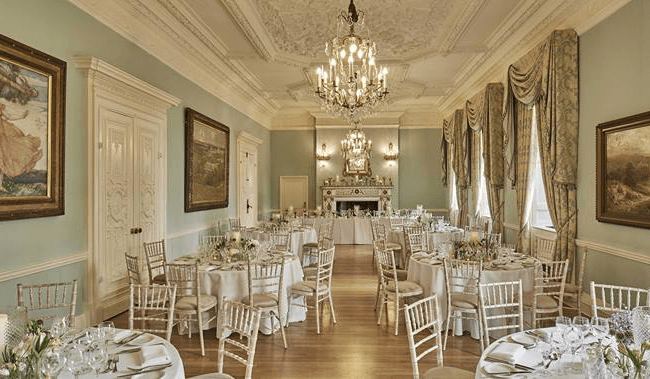 There are thousands of event venues to choose from in London. From large-scale conference venues to intimate galleries and halls, these spaces are adaptable to meet your unique stylistic preferences, layout requirements, and more. Moreover, choosing a world-class event venue effects attendees' perception of your event. There's nothing worse than being shuffled into a cramped and dimly lit conference hall, right? In addition to complementing your business or organization's inclinations, the best event venues are purpose-built to impress your guests, attendees, and visitors. Fortunately, London is host to the United Kingdom's most innovative event spaces, corporate venues, and innovation centers. There is no shortage of dazzling, modern, and expansive event venues tailor-made to deliver unparalleled and value-driven experiences that both you and your guests can enjoy. "London is the most connected city on the planet with unparalleled culture and a greater breadth of unique venues than any other city," says Chris FJ Lynn, Vice President of North American and Emerging Markets at London and Partners, the city's premier convention bureau. When you're tasked with hosting a successful event, your nerves can get the best of you. With so many event spaces to choose from, how do you know which one is right for your business or organization? Additionally, there are broader-scope responsibilities that you need to weigh including deploying event promotions, securing a caterer, developing presentations, managing event registrations, and more. There's a lot of planning and preparation that goes into hosting a high-value and engaging event! In order to alleviate some of this stress, it's important to outline the goals and objectives of your event. What are you trying to accomplish? How do you want your guests to feel before, during, and after your event? How will your event influence your business or organization's larger ambitions? As you start planning, there's a lot of value in honing in on the big picture. Taking time to focus on this broad view and using it to inform your preparation efforts will help you to create a more organized and worthwhile event. The first thing to consider is location and transportation. There are a number of important variables to consider during this step including the venue's proximity to attendees' homes or workplaces. Are your attendees traveling from out of town? Look for venues near major transportation hubs including airports, train stations, subways, and bus terminals. If you're hosting a multi-day event, prioritize event venues that are within walking distance of popular hotels, restaurants, and cafes. Include a convenient and ready-access directory of the area's most popular destinations in your printed event marketing material. Powerful Technology: Select an event venue that offers access to audio-visual components including projectors, televisions, microphones, surround sound, high-speed internet, and more. This technology will have a dramatic impact on the perceived value of your event. Impress your guests by investing in an event space that offers the very best, cutting-edge, and modern technology. Modular Event Space: The best event venues are built-to-suit. These types of modular event spaces can be specially configured to meet your business or organization's unique demands. From large receptions to small seminars, top event venues flex to support a variety of event types. Support Teams: Many event venues provide support teams to assist with day-of operations. An in-house support team is a valuable asset, especially when you lack the staff or personnel to manage the event yourself. Additionally, support teams are able to answer your questions before during and after the event. Extras: Look for event venues that offer value-driven extras including tables, chairs, and linens. If a venue has these items, you can experience some great cost-savings. Some event venues will even offer branded items — table covers, silverware — to match your business or organization's unique aesthetic. How many attendees are you anticipating? Keeping a good headcount is critical when it comes to finding the right event space for hire in London. Why? If you're expecting 500 guests, you can't comfortably accommodate them in a 250-person capacity room. Secondly, fire and safety regulations limit the number of people that you can have in one space. Additionally, knowing the number of attendees will allow you to better budget around food, drink, ticket pricing, seating, and more. In addition to offering next-generation amenities, the best event venues will provide in-house catering options or a list of approved vendors. Ask to sample food in advance and try to accommodate guests' unique dietary preferences and restrictions. Don't try to cut corners with catering! The very best events offer a range of delicious drinks, dishes, and desserts! Finally, pricing is one of the biggest considerations that event organizers must consider. If you're operating on a limited budget, look for low-cost event venues. If you're interested in hosting a more lavish affair, be sure to budget appropriately. Always plan for any last-minute add-ons! The best event venues in London keep pricing transparent. Moreover, many event venues will give an itemized breakdown of every cost included. Review this breakdown carefully to avoid any unexpected expenditures. SAMA Bankside is London's newest bar, restaurant, and event space. Ideal for private dinners, intimate meetings, and corporate events, SAMA Bankside is a critically-acclaimed venue located minutes from the Southbank. In addition to its world-class service and warm interior, SAMA Bankside offers the finest selection of hand-picked drinks and dishes that guests will surely love. Features + Amenities: SAMA Bankside offers two floors of venue spaces. Guests enjoy the exposed brick and wooden floors. SAMA Bankside offers options to hire booths, semi-private areas, and dining room. Additionally, the entire space can be rented to accommodate up to 350 event attendees. The Artworks revitalizes underused properties and transforms them into creative workspaces and social hubs. The Artworks offers three distinct venue locations purpose-built for working, eating, drinking, and socializing. From private parties to talks, conferences, and screenings, the Artworks can accommodate a variety of event types. Guests enjoy the on-site bar and fresh catering options. Features + Amenities: The Artworks offers audio-visual equipment including microphones and projectors, a kitchenette and toilet, whiteboard, flip chart, projector, and more. 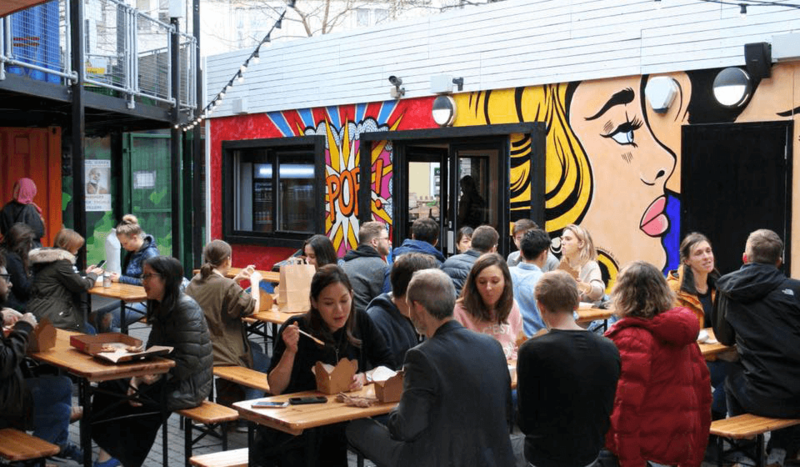 The Artworks Elephant offers a ground floor of food and drink outlets surrounding a vibrant outdoor courtyard. 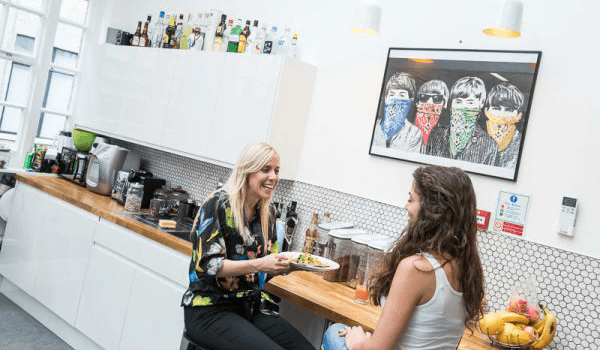 Impact Hub London is a group of coworking and event spaces for a membership of creative entrepreneurs. 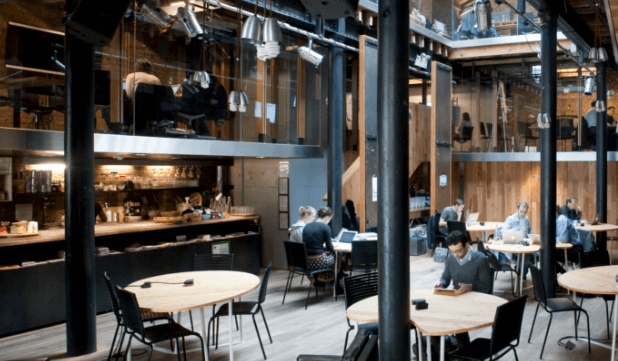 From creative workshops to brainstorming sessions, Impact Hub Islington's three vibrant event spaces deliver unparalleled convenience, access, and support to event attendees. Impact Hub provides registered charities and social enterprises with a 20 percent discount. Features + Amenities: Impact Hub's largest event space can be configured theatre-style or classroom-style. Accessed by its own private entrance and featuring high ceilings with plenty of natural light, the space is designed to exceed guests' expectations. This space can support up to 100 standing guests. Headspace Group is a coworking community designed for businesses and startups in the creative, media, and technology sectors. Additionally, Headspace Group offers workshop and event space to a growing corporate, small businesses, and startup community. The space is equipped to support product launches, seminars, small conferences, and more. Features + Amenities: Headspace Group's largest space supports up to 65 people seated and 150 people standing. Headspace Group offers access to the latest audio-visual equipment. Headspace Group offers independent event access, a private bar, catering options, and security services. 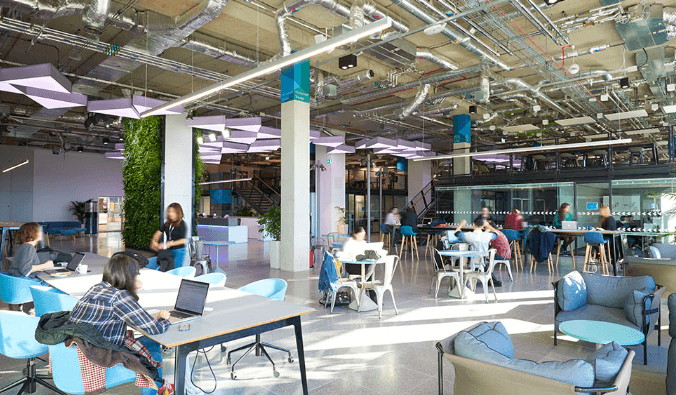 Huckletree has a mix of unique event venues, ideal for disruptive corporate innovators, startups, and agencies. 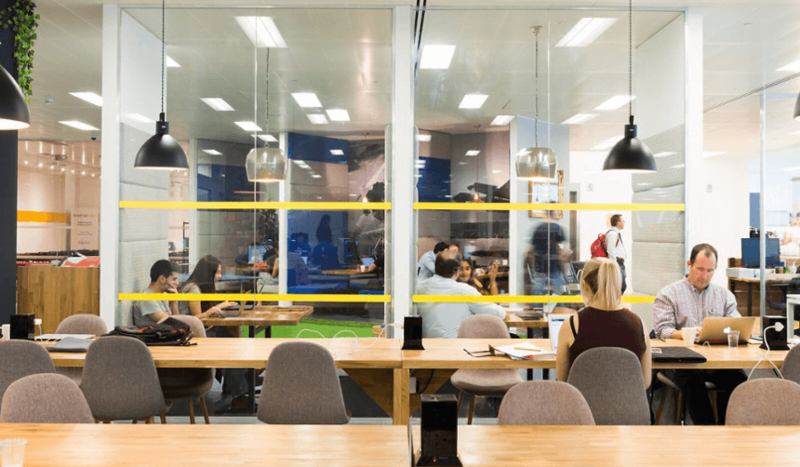 Huckletree offers four distinct event spaces. Each space is kitted out with the latest tech including integrated ticketing. Moreover, event managers are always on hand to provide support. Additionally, Huckletree offers a steep discount when you book for a full day. Features + Amenities: Huckletree offers flexible class and workshop options, wall mounted displayers, wireless and HDMI connectivity for presentations and videos, and more. One of the spaces is even kitted out with the latest VR/AR/MR technology, creating one of the city's leading virtual reality spaces. 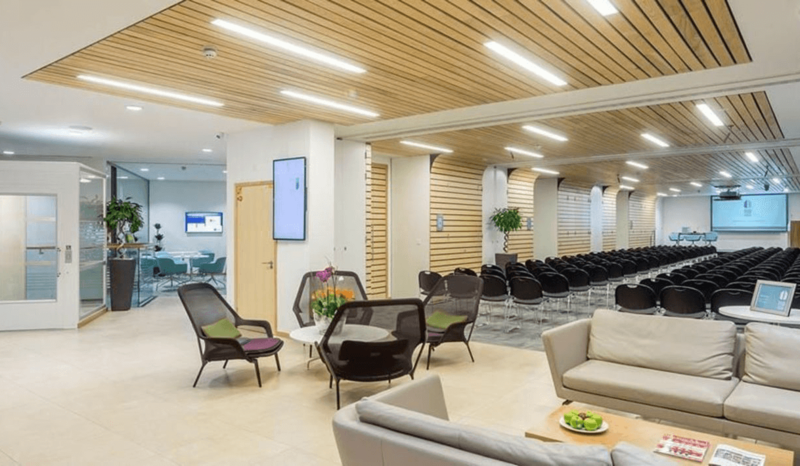 110 Rochester Row offers state-of-the-art event space built to fit your exact specifications. 110 Rochester Row's knowledgeable and creative staff provides expert event organization and support. With easy access to the National Rail Service, District, Circle, and Victoria underground lines, guests enjoy the ease-of-access and convenience that 110 Rochester Row provides. 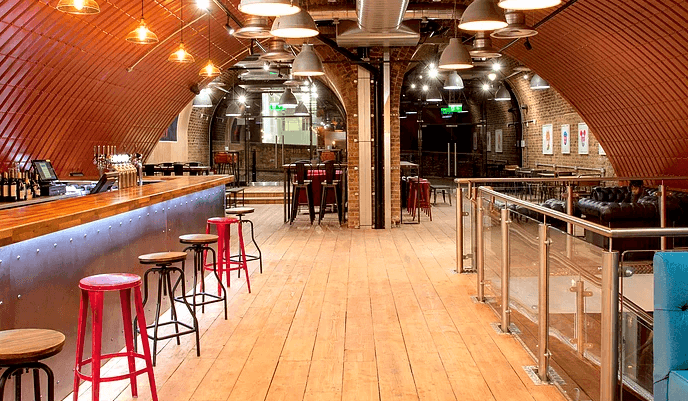 Features + Amenities: 110 Rochester Row's largest event space supports 60 people seated and 180 people standing. Access to projection equipment, public announcement system, high-speed internet, and more. 110 Rochester Row is Disability Discrimination Act (DDA) compliant. Runway East is centered at the heart of the tech and financial districts. Runway East offers two distinct workshop spaces: Hangar58 and The Engine Room. Starting at just £36 per hour, Runway East has hosted industry-leading corporates and startups. Hangar58 is equipped with a fully licensed and private bar. Features + Amenities: Runway East's largest space supports 40 people seated and 150 people standing. Guests enjoy access to a large television screen, projector, high-definition adaptors, and more. Runway East offers tea, coffee, and water. Additionally, guests have access to snacks or lunch for an additional fee. The Ivy is a revered destination in the heart of London's vibrant urban core. 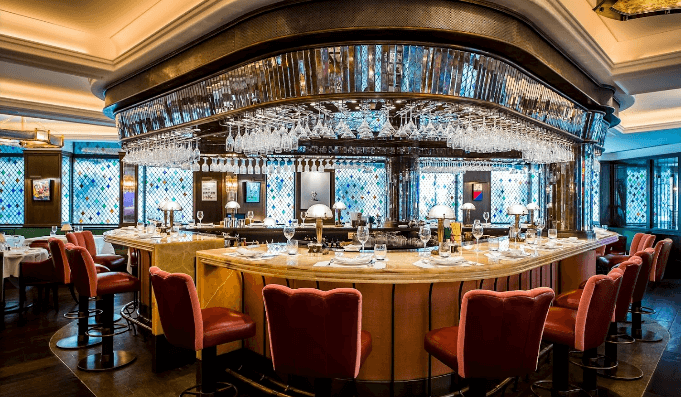 The Ivy's private dining room can accommodate up to 60 people seated and 100 people standing. An ideal location for a corporate dinner, The Ivy offers 13 distinct menus to choose from. Using only the finest ingredients, chefs deliver masterfully prepared drinks and dishes. Features + Amenities: The Ivy offers a bespoke bar, signature harlequin stained glass, and oak paneling. Complimentary flowers, candles, and menu cards are provided for the tables. Additionally, The Ivy can arrange a jazz trio, string quartet, or other non-amplified musical entertainment. 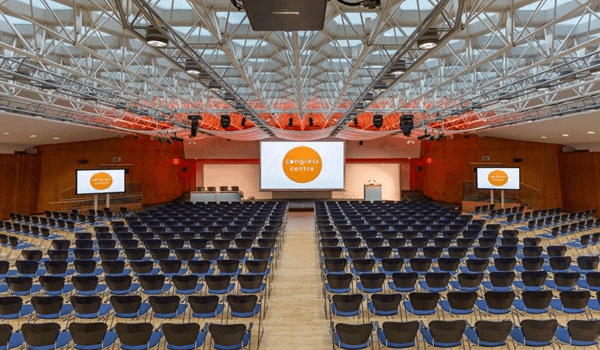 Battersea Evolution is one of the most versatile modern conference venues in London. Battersea Evolution allows for complete customization, specially built for a one-of-a-kind and breathtaking events. Unlike other large event spaces, Battersea Evolution features convenient one level load-in and round-the-clock access. 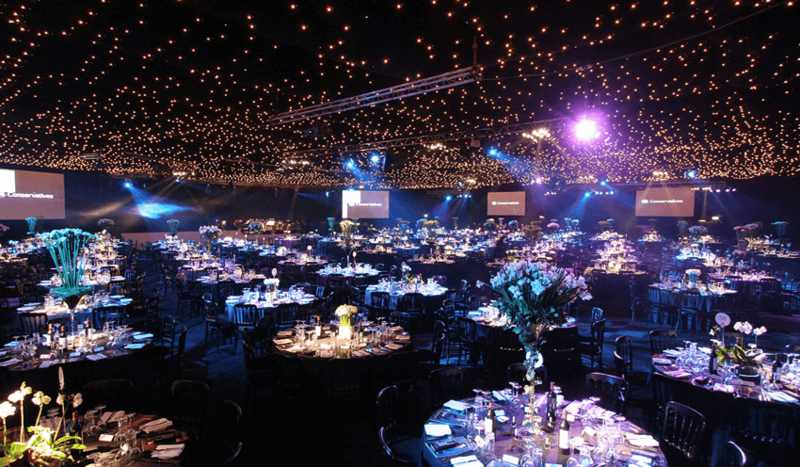 Features + Amenities: Battersea Evolution can accommodate upwards of 4,000 event attendees. Sized at more than 5,000 square meters, the venue can be easily segmented into separate breakouts, marketplaces, and networking areas. Venue Lab offers six distinct venues spread across London. Their 38 Grosvenor Square location is housed in the former Indonesian Embassy. Situated in one of the city's most desirable areas, 38 Grosvenor Square is minutes from major transportation hubs including Bond Street, Marble Arch, and Oxford Street. This elegant townhouse can accommodate up to 200 standing guests. Features + Amenities: Venue Lab offers floor to ceiling views, white walls, and reception areas. There is additional basement space when required. 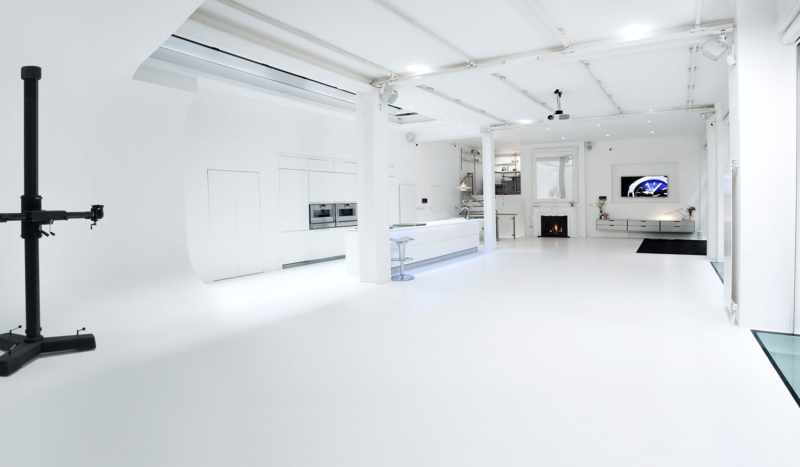 Venue Lab is ideal for launches, conferences, press days, receptions, dinners, pop-ups, and more. 58VE is a new venue located at the heart of central London. 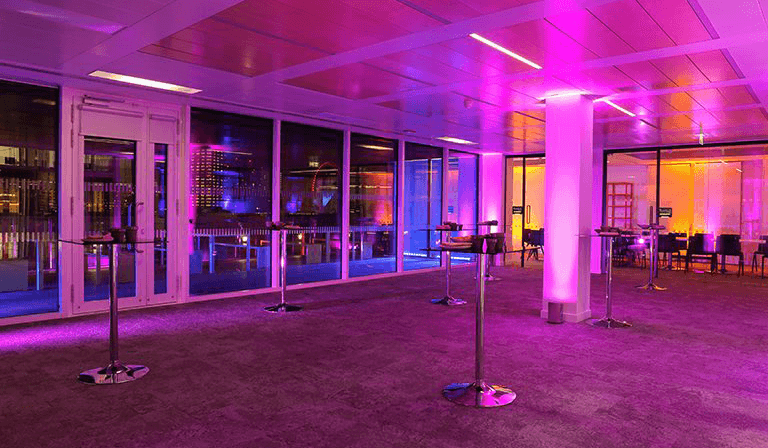 Featuring cutting-edge technology and a creative environment, 58VE is equipped to host a variety of event types including product launches, drink receptions, conferences, and more. 58VE offers expansive views overlooking the River Thames and London's vibrant skyline. Features + Amenities: 58VE offers the latest audio-visual equipment. 58VE allows speakers to broadcast presentations beyond the venue with first-class technology. Congress Centre is one of the premier conference and meeting venues in London. Congress Centre's commitment to customer service and satisfaction has positioned the venue as a popular venue among industry-leading businesses and organizations. The venue offers a wide range of purpose-designed event and exhibition space, technology-driven conference facilities, and outstanding food and beverage services. Features + Amenities: Congress Centre provides access to surround sound system with ceiling voice enhancement speakers, lighting equipment, and in-house specialists and technicians. 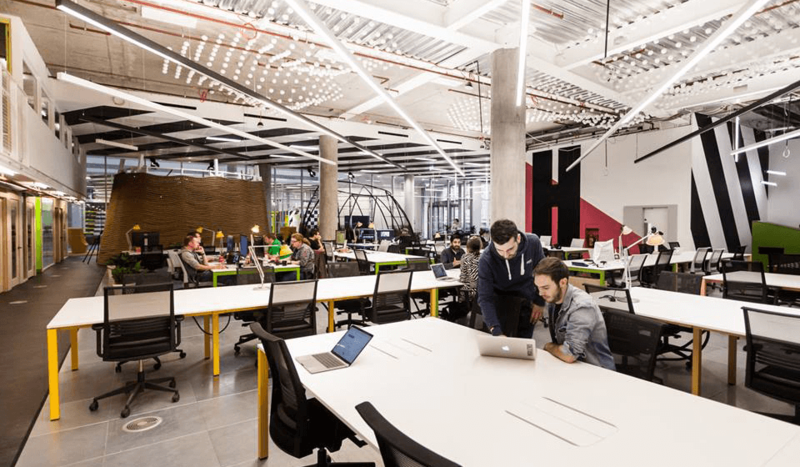 Plexal is the largest innovation center in London. Designed to resemble a mini-city, Plexal offers an indoor park, private phones booths, and one of the best workshop and design spaces for rapid prototyping. 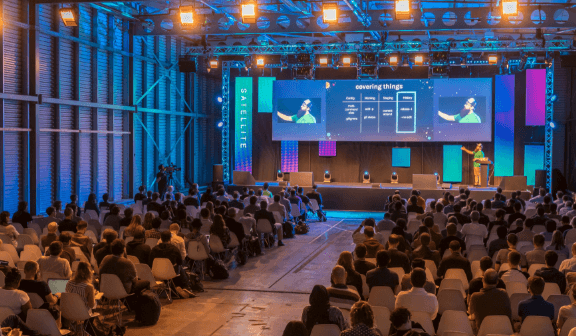 More than a coworking community, Plexel delivers next-generation conference and event space to the world's leading startups, businesses, corporate innovators, and more. Features + Amenities: Plexal can host more than 300 event attendees. Guests have access to cutting-edge audio and visual equipment, bespoke lighting, display monitors, projection screens, and more. Plexal offers pre-approved catering options and vendors as well. 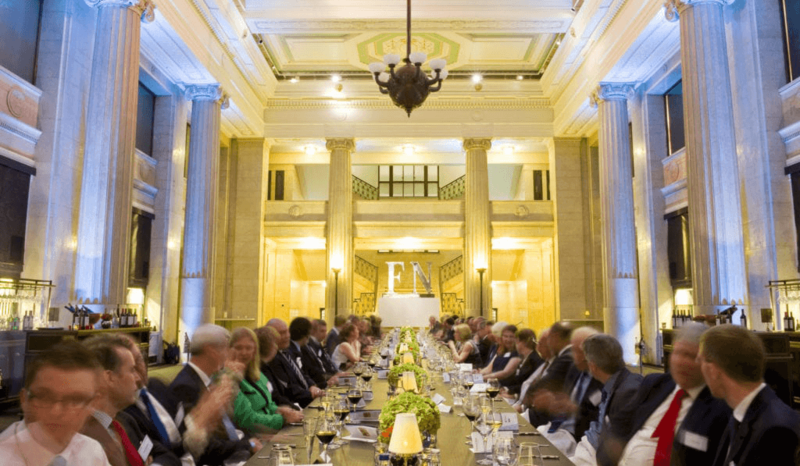 Banking Hall is located at the heart of London. Where art deco meets modern cool, the venue's main hall is both unique and versatile. This impressive venue can accommodate up to 800 standing guests or 280 seated guests. Allow Banking Hall's experienced events team to help you at every stage. Features + Amenities: From dinners to champagne receptions, Banking Hall is well-equipped to support a variety of event types. Guests enjoy Banking Hall's fabulous food and drink options including vegan, gluten free, and dairy free menu options. Dartmouth House is located in an elegant mansion set in the heart of London's Mayfair. From board meetings to seminars, Dartmouth House can accommodate intimate groups of 10 or large groups of 450 for standing drinks receptions. Dartmouth House is minutes from Berkeley Square and Bond Street. Features + Amenities: Dartmouth House is dressed in grand and classical motifs. The venue serves as an exceptional canvas for all event types or meeting needs. Dartmouth House can provide quotes over the phone for urgent or last-minute inquiries. Tobacco Dock is within striking distance of Tech City and London's Financial District. Tobacco Dock is supported by one of the most technologically advanced information technology infrastructures. The space is perfectly adaptable to provide an intimate setting for board meetings, large-scale exhibitions, and more. 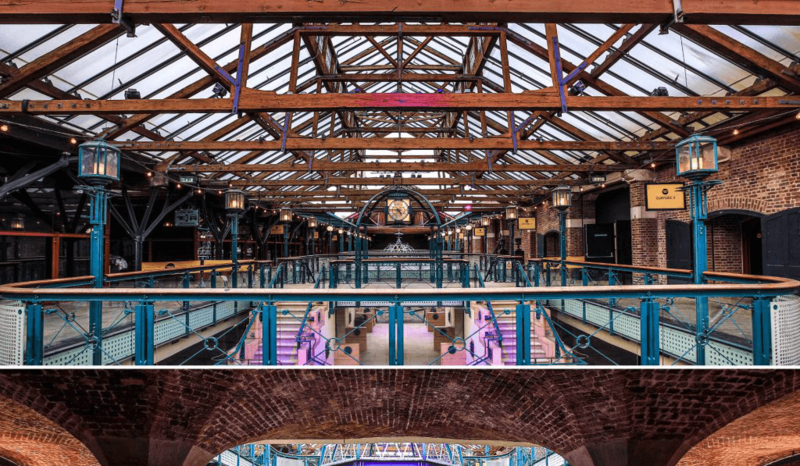 Features + Amenities: Tobacco Dock offers stunning timber beams, indoor and outdoor courtyards, multiple event spaces, access to natural daylight, and waterside views. Icetank is a unique blank canvas event space. Ideal for press launches, conferences, private dining, receptions, parties, and more, Icetank is completely customizable to support almost any event space. Hosts can event put a stamp on the space with special branding or design motifs. Features + Amenities: Icetank is 171 sqm spread across two floors. Maximum capacity of 120 standing guests across both floors. Floor to ceiling windows with blackout curtains, luxury demo kitchen with fully functional catering kitchen, furniture, audio-visual equipment, and more. 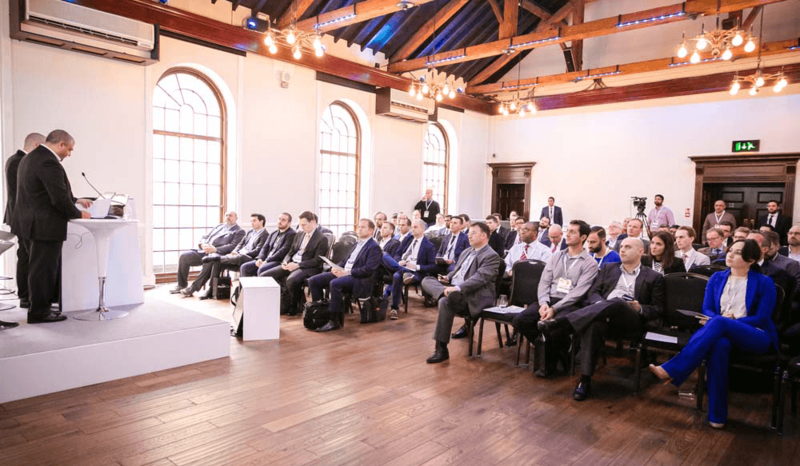 The Brewery is frequently recognized as one of London's leading event and conference venues. Awarded for its service, planning, and food and beverage options, The Brewery has delivered spectacular events for more than a half decade. The Brewery couples refined architecture with modern and cutting-edge technology, creating a stunning event space nestled within the city. Features + Amenities: The Brewery can accommodate up to 1,000 conference attendees across six diverse and multi-functional event spaces. Access to an integrated public announcement system, high-speed internet, built-in projector, conference collaboration, and more. Your search for a premier London events venue is over. RocketSpace is an industry-leading tech hub built for the world's brightest tech startups and scale-ups. RocketSpace provides Seed to Series C funded tech startups with flexible coworking space, growth-oriented programming, and much more. In addition to these members-only offerings, RocketSpace provides cutting-edge and technology-driven event space for leading businesses, enterprises, organizations, nonprofits, and more. From small, intimate events to large-scale affairs, RocketSpace is well-equipped to support a variety of event types including board meetings, networking and drinks, conferences, away days, off-sites, pitches, demo days, and product launches. RocketSpace's flexible and configurable event space offers advanced features and amenities including an expansive video wall, mics, lighting, keynote lecterns, high-speed internet, tech support, event management support, registration desk, separate events entrance, and more. Additionally, RocketSpace's expert and accommodating team delivers unparalleled support before, during, and after your event. There is no better to host your upcoming event in London! Contact RocketSpace today. Are you ready to book your event at London's premier events venue? RocketSpace is located at 40 Islington High Street, London N1 8EQ, United Kingdom. For more information, call +44 20 3865 5879 or email eventsUK@rocketspace.com. Due to high demand, we currently have limited available space for rental. For inquiries, please fill out the following request form, and we will be in touch shortly.